We hoped you had fun, had your mind blown once or twice, and maybe even met some new friends. Conference materials will be available for the following week, through 11:59 p.m. EST on February 17th. If you registered for Extended Access, you’re able to view the materials for a month, through 11:59 p.m. EST on March 10th. If you missed any events or want to rewatch on your own time, this is a great way to catch up! Also: unlike all the Avengers, WriteOnCon will return in 2020! Until then, we would love to hear from you so we can make the conference even better next year. As a special thank you, survey participants will be entered in a random drawing for five tickets for extended admission. 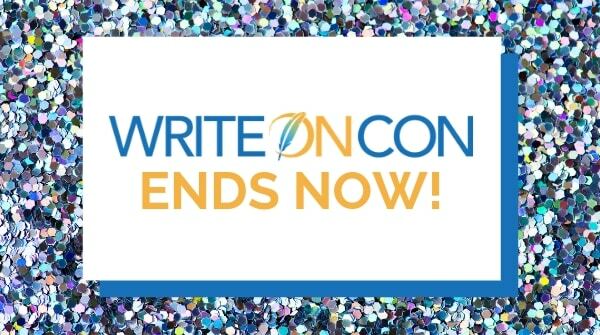 Help us make WriteOnCon rock even more in 2020 — we’d love to hear your thoughts! Speaking of random drawings: don’t forget that we’ll be drawing raffle winners! All attendees are automatically entered. We have a ton of cool bookish prizes ready for you! The winners’ list will go live in the next few days. And that’s a wrap, everyone! We hope to see you all next year. Now get out there and put everything you learned this weekend into practice! Another fabulous WriteOnCon! I can’t wait to see what 2020 has in store! This was my first WriteOnCon and I’m exhausted! I learned a lot and still have lots of materials to catch up on. Thanks for an awesome experience! Same as Mary – thank you so much to the team and all the presenters for the opportunity to learn and experience.